Nate Hill licensed flyfishing guide and owner of White Mountain Flyfishing has been guided flyfishing trips on the Saco River, Androscoggin River, Ellis River for years. Based in Conway NH Nate travels to all areas of New Hampshire for the best fishing year round. If you don't see Nate fishing you will probably find him at Attitash or Wildcat skiing with friends or instructing. When Nate was eleven years old he put a fly rod on his Christmas list. Once armed with the appropriate gear, he spent his adolescence improving his fly fishing skills on the Ellis and Saco Rivers. 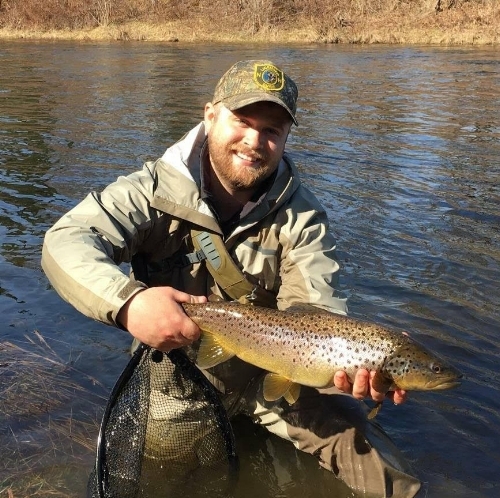 After high school Nate attended UNH and while he worked on his Masters of English Teaching, most of his free time was spent mastering fly fishing on the Lamprey, Cocheco, and Isinglass rivers. During the summer months his time was spent on the Androscoggin, Ellis and Saco rivers. Then, between his junior and senior years, he landed an internship with the Federation of Fly Fishers in Livingston, Montana. There, he fine tuned his casting, tying, and fishing skills, but more importantly, he learned how to instruct others. Upon returning to New Hampshire he had to decide whether or not to move to Montana or stay in New Hampshire. He chose the later and soon got a job teaching high school English in the Mount Washington Valley. Later that year he got his guide's license and spent that summer and the following eight summers guiding on the Ellis, Saco and Androscoggin rivers. When not guiding Nate spends his free time on the waters he grew up on, finding new places to explore. To further this exploration Nate has spent the past few years covering the larger rivers with a Pac 1300 raft. This craft has allowed him to access river miles not accessible by foot or hard boats. While float fishing is Nate's newest obsession, he will never be able to resist chasing wild brook trout in small mountain streams, and ponds. Over the years Nate has built a base of repeat customers that has allowed his business to grow every year. Nate takes pride in his ability to put clients on fish regardless of their ability. He recently wrote a chapter on the Ellis River for the Book 50 Best Places: Fly Fishing the Northeast by Bob Mallard. He is also featured in the book 25 Best: Towns To Fly Fish For Trout and will be featured in the upcomming book 50 Best Places: Fly Fishing For Brook Trout. Nate will also have a chapter dedicated to him in the upcoming photography book Passion America by William Combs. From December through February Nate can be found instructing skiing at Attitash Ski Resort. Nate has done some destination Guiding to the White and Norfork Rivers in northwestern Arkansas. From 2016 to 1018 he had the pleasure of guiding clients over some of the best brown trout fishing in the country. While Nate stayed in NH this year to spend time with his 10 month old daughter Vivian he is planning to host trips again in the near future. Please stay tuned! Steve grew up on his family's plot of land on the banks of Maine's Kennebec River in the small mill town of Skowhegan. It was a name given to the area by the Abenaki, meaning "A place to watch". And watch they did, as every fall hundreds of thousands of Atlantic Salmon made their return to spawn in their natal homewaters. Ted Williams, Curt Gowdy, Gaddabout Gaddis and many others flocked to the Kennebec in droves to fish her fertile waters. Fishing the banks of the river, for him, started at age 3, targeting smallmouth bass. As his father became more involved in the sport of fly fishing, he was given his first fly rod at age 6, an old blue fiberglass beauty with missing guides and broken thread wraps. Over the years it caught lots of fish but eventually succumbed to his lack of attention on a muddy bank. Fly fishing became a pursuit unlike any other, and most of his youth was spent on remote trout ponds in Northern Maine, cold and wet but happy. In high school he rediscovered river fishing. The East Outlet of the Kennebec, the Roach, St. John and several other unnamed haunts were what motivated him through the tedium of the school year. Summer days of brook trout and salmon fishing seemed endless, and by his senior year he had convinced himself that he would be heavily involved in the fly fishing industry. After a failed attempt at a formal college degree in Adventure Recreation, he moved west and spent time on the Colorado River in Arizona working for Lees Ferry Anglers under the tutelage of Wendy and Terry Gunn. After that he branched out and fished much of the famous West, learning new techniques, how to row a driftboat, and the finer points of modern gear, untangling 8x tippet and deep nymphing. He learned more than he will probably ever be able to share with one person. Returning to Maine due to a family illness, he found himself working at Kennebec River outfitters in Madison, Maine under Bob Mallard, who was and remains an excellent wealth of knowledge and helpful resource. Finding his way back to his natal waters on the Kennebec, he focused on learning as much as he could about brown trout, streamer fishing, and rowing a driftboat full of anglers casting giant rabbit strip patterns at undercut banks. He fished every single calender day of 2004, with most days spent on the Kennebec. He learned much from his decade of tenure at KRO and remains close friends with Bob to this day. In 2010 he formed a company and developed a product for fly rod care and cleaning. Then he moved to New Hampshire and started working for a power company as an Electrical Lineman. Later on he became a registered NH guide, and has recently been featured in 50 Best Places: Fly Fishing The Northeast. Nowadays, he guides as a hobby. While he enjoys his work as a lineman, he guides for fun, and to pass along his knowledge to others. He makes it a priority to tailor a trip to his client's needs. Whether that need is a focus on casting, reading water, or just a need to get out and relax, Steve has the knowledge and experience to meet any specific requests.Hard work and dedication are essential in any line of work, and Steve's guiding reputation has been built on those basic foundations. Tom has been fly fishing the waters of Northern New England since he was a kid. His father, an avid fly fisherman, introduced Tom to the wonderful sport and he has been an addict ever since. Originally from Massachusetts, Tom’s family owned a vacation home in Errol NH and spent as much time there as they could. When he was a teenager, Tom’s family moved to Errol full time. This afforded him more time to explore and fish the water’s in and around Errol. As he got older, Tom began to venture out and explore other waters in nearby Pittsburg NH and Rangeley ME, as well as in the backcountry of Northern NH. When it came time to go to college, it only made sense that Tom would study a subject close to his heart. He attended Unity College in Central Maine from 2003-2007, where he earned his Bachelor’s Degree in Fisheries Science. After college, he yearned to stay in the woods of Northern NH. Tom spent some time working as a seasonal Fisheries Technician for NH Fish and Game, and more recently spent time working in commercial aquaculture. In 2013, Tom decided that he wanted to share his love and knowledge of fly fishing with others, and became a licensed guide in both Maine and New Hampshire. He has spent time guiding the wild brook trout streams and ponds of far Northern Maine, as well as sharing the tremendous trout fishing of his home waters in and around Errol. Tom devotes himself whole-heartedly to his fly fishing passion. When he isn’t guiding, he is fishing on his own trying to refine his craft, mastering new techniques, tying his own custom flies, and researching ways to become a better fisherman. Tom is always happy to share his love of fishing and his deep love of wild trout and conservation. Mason with a healthy Northern NH Brown trout. Raised in the Androscoggin valley, the great outdoors has always been a passion for Mason. Of all the activities NH offers, Fly fishing has been the center of his attention, since he began casting a fly rod and tying flies at an early age. Mason spent most of his childhood fly fishing the Androscoggin River near his grandparents house in Shelburne NH, walking up and down its banks studying the bug life and trout habitats from one pool to the next. Since the day he received his drivers license Mason has never stopped exploring the locals waters. Mason first discovered his interest in guiding from his time as a camp counselor for Barry 4-H Camp. This is where he first learned the joy of sharing his knowledge and personal experiences through instructing others on how to fish. Watching somebody catch their first fish on a fly rod got Mason hooked on guiding. Mason has had some of the north countries best teachers and mentors. One of them being Charlie Lowe a local fly fishing legend and close friend to Mason. Charlie lived his entire life in the valley and showed Mason the art of fly tying, reading a river, and the many nooks and crannies where trout hide in the Androscoggin River. Mason has also been under the wing of Nate Hill for the past few years mastering his drift boat and instruction skills. In addition to guiding Mason can be found at North Country Angler Fy Shop giving a hand to any fellow Angler who walks through the door.You won't find a more passionate enthusiastic guide than Mason Thagouras. Kevin has spent nearly two decades honing his fly fishing and fly tying skills to provide his clients with the best possible chance of connecting with fish. Kevin lives in Bethlehem New Hampshire, where he owns and operates a small farm with his wife. Providing the western white mountains with cut-flowers. Eggs, and local meats. When guiding, Kevin specializes in cold water wade trips, targeting beautiful native Brook Trout, as well as sizable Brown and Rainbow Trout. Clients have the opportunity to fish the region’s best waters including: the Ammonoosuc, Androscoggin, Connecticut, Saco and Pemigewasset Rivers, as well as remote hike-in trout ponds. Kevin is a skilled instructor and loves sharing his extensive knowledge on finding fish, reading water, and aquatic entymology. In addition to Kevin’s fishing skills, he is well versed in the identification of native plants, mushrooms, birds, and wildlife tracks. Clients will enjoy learning about the diverse flora and fauna of the region while navigating the Mountain Streams of New Hampshire. Your safety is of our utmost concern. All state guides must be CPR and First Aid certified and we are. When on the water we will ensure that you are comfortable with the challenge of terrain, and we will help you whenever you need. Please always listen to your guide in regard to safety protocols when on the water. If the guide says to sit when in the boat...stay seated. If the guide tells you not to wade in a certain area DO NOT. We have never had a serious injury on any of our trips and we hope to keep it that way! "You can give a man a fish and feed him for a day, or you can teach a man to fish and feed his soul for a lifetime." For us guiding is all about teaching. We want you to catch fish when you go out with us an more than 90% of the time you will. However, it is even more important to us that you learn how to catch fish when you are not with us. Our service to you is not only a one day fishing trip but an investment in your ability to catch fish for years to come. For this reason We love guiding kids. Children as young as five have caught trout on our trips and we don’t place an age minimum on our trips for that reason. While we enjoy the excitement of young fishermen, we also enjoy the satisfaction of seeing adults discover this sport too. It is a great pleasure to teach veteran anglers new tricks to add to their repertoire. We enjoy guiding because we know we are giving valuable knowledge to all of you. We work our hardest to put state of the art gear in our clients hands. We carry only the top brands in the industry and try to buy American made products whenever possible. Know that when you fish with us you will be well equipped. We believe fly fishing is the best way we have of understanding nature without destroying her. Thus, we owe it to the fish to conserve them, For this reason we practice catch and release on all of our trips.